For the second time in its history, the Sepang International Circuit is all-set to host a round of the eni FIM Superbike World Championship. Just a stone’s throw from Kuala Lumpur International Airport, the venue first featured on the calendar last year. It now returns two months later in the year than it did in 2014. The 2014 edition – held in June as opposed to August and Round 6 as opposed to Round 10 – featured a double for Aprilia, as Marco Melandri led home Sylvain Guintoli in both races. This proved to be a mighty important round for the latter, as the Frenchman collected a total of 40 points which proved crucial in his World Championship fight with Tom Sykes. The meeting is arguably best remembered the incident that took out Sykes at Turn 2 in Race 1, as both he and Alex Lowes were taken down by Sykes’ wayward team-mate Loris Baz. In a very different set of circumstances, Sykes returns to Sepang second in the championship but a huge 125 points behind Kawasaki Racing Team partner Jonathan Rea. Last time out at Laguna Seca in California, it was Sykes who finished second in both race ahead of Rea, whose pair of third places ironically marked his worst weekend of the season so far. Although 200 points are still up for grabs between now and Qatar at the end of the season in October, Rea could wrap up the title in Malaysia, should he score 25 points more than Sykes. Other than that, the Northern Irishman is also looking to extend his run of consecutive podium finishes; he is currently on 19, meaning he would beat Colin Edwards’ run of 25 should he finish on the rostrum in every race up to and including Losail Race 1. 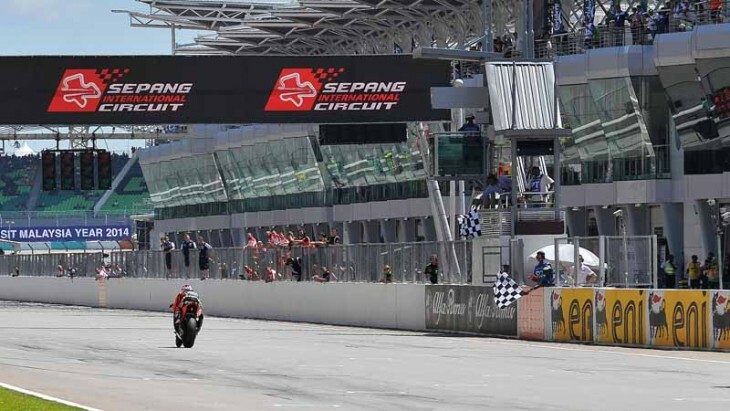 Incidentally, if the title is clinched by Rea in Malaysia, the triumph could only occur in the second of the two races. What about Ducati? The Italian marque collected its first double since Imola 2012 (with Carlos Checa) as Chaz Davies stunningly won both Laguna Seca races two weekends ago. This marked the Welshman’s own first double since Aragon 2013 and the first for the Ducati Panigale model, which debuted in World Superbike at the start of the 2013 campaign. Surely the Panigale has everything required to succeed at Sepang, with a twin-cylinder engine configuration and horsepower by the bucketful. Davies will be the only factory Ducati rider on-track in Malaysia as team-mate Davide Giugliano has been ruled out of the remaining rounds of the season due to the spinal injury he sustained at Laguna Seca. The team has decided not to replace Giugliano for the upcoming event, while his seat at Jerez in September will be taken by Michele Pirro. Also making headlines on the run-up to Sepang is Max Biaggi, as the WorldSBK Champion of 2010 and 2012 returns for his second wildcard outing of 2015, after Misano. This time, he has prepared for the event with four days of testing at the Malaysian venue, although three of the four are reported to have been affected by rain. Nevertheless, the Italian – who last raced at Sepang a decade ago in MotoGP – is looking to continue his good form following his pair of sixth places at the Riviera di Rimini Round. Elsewhere, Aprilia Racing Team – Red Devils riders Leon Haslam and Jordi Torres both left Laguna disappointed, while the likes of Pata Honda World Superbike Team’s Guintoli and Michael van der Mark are looking for that extra boost to carry them to podiums. The same could be said for BMW Motorrad Italia SBK Team’s Ayrton Badovini and Voltcom Crescent Suzuki’s Alex Lowes, who each took one sixth place but one race retirement away from the last round. Both van der Mark and Lowes heads directly to Sepang from the Suzuka 8 Hours. Spanish rookies Roman Ramos (Team Go Eleven Kawasaki) and the aforementioned Torres already know the Sepang International Circuit, albeit on different machinery, while the venue will be new for Barni Racing Team’s Leandro Mercado; he has finished in the points this year in every race bar one – and only Jonathan Rea beats that. Santiago Barragan will not take part in the Pirelli Malaysian Round as he opted for an early end to his partnership with Team Grillini Kawasaki.